When Mark gives the record of Jesus’ last supper, he provides us a curious detail at the conclusion to the disciples’ time in that upper room. He writes, “After singing psalms, they went out to the Mount of Olives” (Mk 14:26). Those familiar with the story know, of course, that it’s at the Mount of Olives that Jesus is soon betrayed by Judas and arrested, ushered to his midnight trial and the next day executed on the cross. Harrowing events face Jesus in this final night, and Mark tells us that Jesus and his disciples do a bit of singing before the plot races toward its conclusion. What in the world could they have sung? Traditionally, there are a short set of Psalms that the Jews sing or recite as part of their Passover observances. Psalms 113-118 are known as the Hillel Psalms and largely reflect on God’s covenant faithfulness toward his people, both in the past and in their hopes for the future. They reassure the faithful people of God that, just as the Lord had rescued his people from the hands of the Egyptians at the time of Moses, so too would he again one day save them and decisively. It is altogether likely that Jesus and his disciples were singing these Psalms before departing the dining room for the Mount of Olives and the Garden of Gethsemane. And it is quite an expression of Jesus’ faith, knowing what he was in for over the next several hours. Psalm 118, the last Jesus likely sang, opens with a traditional refrain of God’s faithfulness: “Give thanks to the Lord, for he is good; his faithful love endures forever” (Ps 118:1). It is a recitation of God’s unfailing commitment to his people. Surely, the Lord will be good to Israel in the end. Now Jesus moves toward a declaration of God’s impending victory over the wicked nations. “All the nations surrounded me; in the name of the Lord I destroyed them. They surrounded me, yes, they surrounded me; in the name of the Lord I destroyed them” (vv. 10-11). For a Jew in the first century, it is altogether likely his mind would have turned to the Roman legions that occupied Jerusalem. For Jesus, it likely was not lost on him that these Roman authorities would be the very ones executing him. And most Jews likely would have nodded along or even exclaimed at this point: “I destroyed them!” Surely Jesus knew he would be leveling a certain kind of destruction on the enemy of God’s people, but it would not appear the way so many hoped or expected, neither in the means nor the target. No, Jesus’ path to victory was not lined with soldiers, chariots, swords and shields. Rather, his path marched through the cross and into the grave. And, further, the Romans were not his enemy, but another force far more vile. And yet, somehow, Jesus is then able to utter this poignant line: “I will not die, but I will live and proclaim what the Lord has done” (v. 17). What confidence the Christ must have had in his God! How can he express such faith? How can he be so certain, knowing what he is about to face? Yet Jesus is sure that he will walk faithfully through this impending horror, to be welcomed by the Lord on the other side. “Open the gates of righteousness for me; I will enter through them and give thanks to the Lord” (v. 19). And did Jesus know he was speaking of himself a few lines later? “Bind the festival sacrifice with cords to the horns of the altar” (v. 27b). He had to, and yet he gives his full-throated suport just the same. How can he do this? How can Jesus hold his head so high in the face of the dire path he’s about to take? He does so by reciting again Israel’s refrain of confidence in their God: “Give thanks to the Lord, for he is good; his faithful love endures forever” (v. 29). And then he walks out along the path toward Gethsemane and Golgotha, the path to the cross and his own death, the path to victory. The fabric of my life was suddenly too thin, the once-plush cloth of all the people who knew me when, now threadbare. Another fiber pulled away yesterday, unraveling a piece of my history as it went. Suddenly the weave was so thin, I feared it would dissolve in my hands. My friend died, one of the ones who was always there, always praying, always believing… and always worrying in a good sort of way. We didn’t speak often, but she was there, caring and loving even when she was in pain. Her body gave out way too soon and the hole she left made me gasp. I didn’t realize how big her fabric thread was. Almost forty years ago she promised to pray for us, and she and her husband never forgot. They prayed for us. Every. Single. Day. All of a sudden, I felt very lonely. “Who will pray for us now,” I sobbed to my husband as unwanted tears wet my cheek. “She’s still praying!” He smiled a gentle smile, comfort in his eyes along with tears. Confused, I tilted my head, my eyes asking questions my brain couldn’t answer. “All the company of heaven!” He threw his head back as he laughed, “that’s what that verse means. She’s still praying for us, along with all the saints in heaven!” Oh. Wait. Right. I forgot. And suddenly, the veil between earth and heaven seemed almost transparent. I wanted to pour out my heart, tell her everything I’d missed saying, everything that had happened, and everything that hadn’t. But more, I knew I’d see her again, along with all the rest of the dwindling tribe of elders in my life. Grief made me forget, but suddenly I remembered. The resurrection. His, Jesus’s, that overcame death, and ours, to everlasting hope. The forever family, friends and community that would once again be together, the fabric no longer thin but mesmerizingly complete. I would see her again. I would tell her about the ministry she helped us birth, and what God did. I would tell her about worship, and healing, and prayer, and wounded hearts made whole, but she would already know. Easter would win over dark Good Friday. Life over death, dancing instead of mourning, beauty for ashes, celebration in place of abandonment. I looked down at my hands and imagined. Transformed, the fabric sparkled in my eyes, alive with the hope of heaven and the glory of resurrection. I tell you the truth; whoever believes in me will be able to do what I have done, but they will do even greater things because I will return to be with the Father. 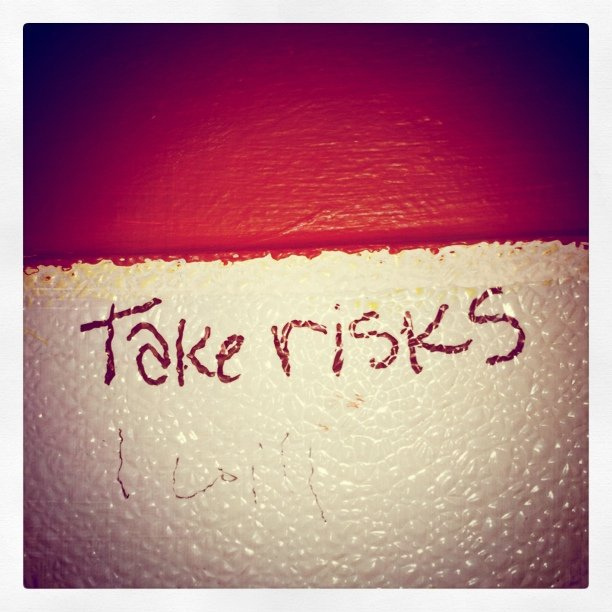 “Take more risks,” he wrote, thanking me for sharing my testimony and obeying the Holy Spirit’s lead. His words glaringly dared me. I’m not unwilling to risk, it simply scares me. Partly, because I fear losing control, making mistakes or being misunderstood. Words wield powerfully through a person’s core—either to encourage and empower or to tear down and wound—like a double edged sword. What if my words come out all wrong? What if I inadvertently wound or present myself a fool? It’s one thing to publish a faceless article, but to bare those words publicly? That’s risky business. A good teacher will never ask his students to do what he cannot or will not attempt to do himself. Jesus was a good student. He watched his Father, listened to him, and then did what the Father was doing. We—followers of Jesus—are called to do what He did; to watch what the Father is doing and mimic him. That’s risky, yes! But did you catch what Jesus said? “And surely I am with you always…” Jesus returned to His Father so that the Holy Spirit could come and reside in us, with us and among us. That’s not only comforting but empowering! Jesus did not commission us to hide anonymously in our comfortable solitude, but rather he called us to go! He’s called us share our stories of how he rescued us and is restoring our lives to become all he created us to be. Everyone has a story—everyone—and it needs telling. Why? Because when we speak aloud our personal victories through Jesus, we defeat Satan and his destructive work here on earth. Are you willing to take more risks? Are you willing to share your Jesus story and bare the truth beyond your own door? If we say we’re followers of Jesus, then we must risk everything—even our comfort and reputation—to go where the Father leads and do what the Father is doing. But be assured, we are not alone. Jesus is with us. Emmanuel. In early 2012, we felt like God was asking us to sell our house. We put our house on the market, and after a few weeks, it sold. Which meant we needed to figure out where we would go next. We prayed and God was silent. So, we started looking for rental properties. We found one we loved that stretched our weekly budget, but we decided to take a risk and go for it. On the morning we were scheduled to sign the lease I got a call from the realtor who sold our house. My first reaction was, “What do we do? If we wait we will loose the lease, if we sign the lease, we could end up paying for a lease and a mortgage on a house that has foundation issues that are expensive to fix!” We weren’t those people who took financial risks. We liked safe and secure. Surely, this wasn’t how God intended this to work out. Our family went to the leasing agent’s office to sign the lease. Afterwards, we went to a cafe, and my kids had permission to order things I wouldn’t normally allow because this was a “goodness” celebration. We shared our “good God stories.” The stories of God’s goodness towards us and others–His provision and healing–until we could feel His brightness and hope. The Son had come out to party with us! This was a defining moment for me. I learned trust is a weapon that defies fear by enjoying God’s goodness. I learned to sit down and feast on His goodness while surrounded by the enemy and by partnering with God’s goodness, we robbed fear of its power and influence. It wasn’t something I had done with intentionality or defiance before. In the midst of the journey of obeying and trusting God, bad things happen, but I’m increasingly allowing the “Good Shepherd” to care for me and denying fear a seat at the table. You prepare a feast for me in the presence of my enemies. I stepped onto the elevator outside of my office and pushed G-2 for the garage level. Not necessarily expecting to pick up a passenger, I moved to the back corner of the car. Though not the same hue as the wood paneled walls, my lawyerly garb blended into the background. Prior to reaching my destination, the car came to a halt. A gentleman engaged in a friendly conversation backed his way into the elevator and waived goodbye to his colleague. He selected his desired floor and slowly inched backwards. Suddenly, aware of my presence in the corner of the car, he jumped and shouted, “Jesus, you scared me!” I like when people see Jesus in me. There is an interesting account in Luke 24 of two of Jesus’ disciples walking to Emmaus. En route, the resurrected Jesus joins them. Neither has any clue that it was Him. Jesus then asks what they are discussing. Astonished, they recount all of the things that had happened several days prior. They explain that Jesus was a prophet whom they thought was going to redeem Israel. Unfortunately, that hope was dashed when He was crucified and buried. The disciples also describe how on the third day, the tomb was found empty by certain women and other members of their group. Beginning with Moses and the Prophets, Jesus begins to teach them the Messiah had to suffer the way that He did. When they reach their destination, He continues on the path but they invite Him to join them. As they sit down to eat, Jesus blessed and broke bread and gave it to them. This familiar gesture finally woke them from zombie land because they finally recognized Him. Naturally, Jesus immediately disappeared before their very eyes. In today’s society, we can become so distracted that we don’t see things that are right in front of our face. The other day I read an article about distracted walking. People using their smart phones walk in to all sorts of things like trash cans, cement blockades and even water fountains. If we are not careful, we too could miss an encounter with Jesus. Like the disciples on the road to Emmaus, He longs to walk along the road of life with us to teach us the things of the kingdom. He wants to share intimacy with us as we sit and break bread with Him. As we prepare to celebrate Easter, be mindful of distractions and keep your eyes focused on Jesus. It will be less painful than walking into a water fountain.